ICYMI, Taapsee Pannu has been hitting the home run with each and every one of her outfits lately. We're ones to give credit where it's due so, let us also disclose to you why her looks are so inspired - her stylist. Devki is doing a brill job with the Bollywood star's wardrobe and it shows! For Manmarziyaan promotions yesterday, Devki chose an Indi-chic look for Pannu. Taapsee mixed and matched her way to this unique outfit, which despite being western, has an undeniably desi vibe to it. 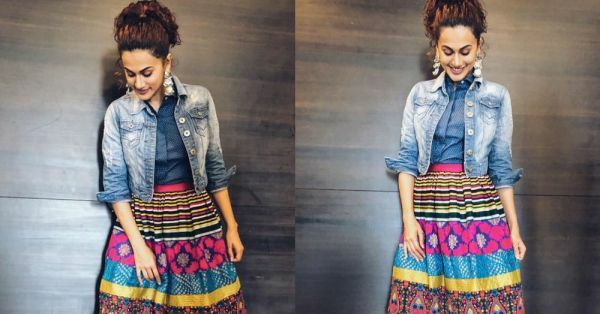 Tucking an indigo Vero Moda shirt into a vibrant patchwork skirt made with chunky borders with different patterns, Taapsee injected a dose of 'India' into the look. We absolutely love the skirt and how she layered it with a cropped denim jacket by Diesel. Denim jackets, BTW, are your best friend. Whether the look is Indian or western, adding a roughed up denim jacket will lend your look some more character. Always. Another trick to Indianise a western look is to switch up the accessories like Taapsee did. She paired her look with simple black Kolhapuri chappals and oxidised lotus danglers from Hyperbole Accessories. All the college-going girls reading this, here's something new to try for class tomorrow. It's easy and it's Bollywood approved - you don't need to wear kurtas to look desi and Taapsee is proof enough, isn't she? P.S. 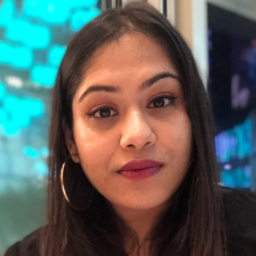 We recreated one of her fusion looks and it's worth checking out!